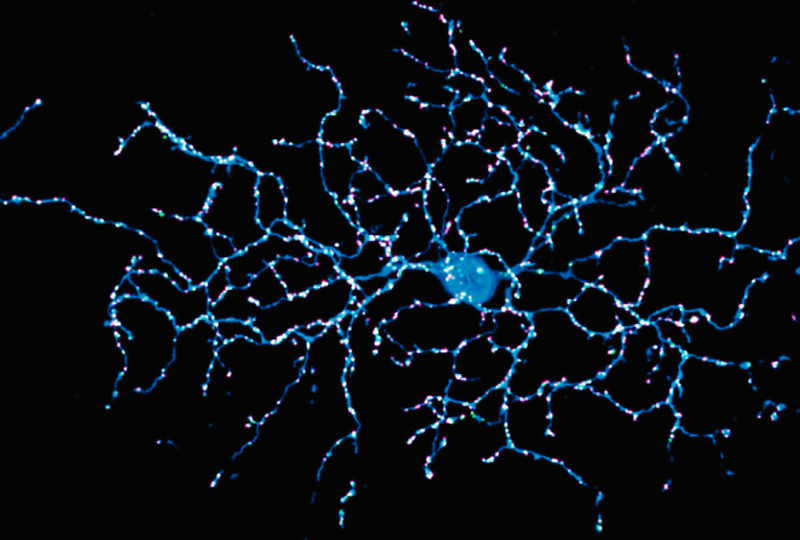 Branching out: A retinal neuron (blue) connects with many neighboring neurons, with proteins at these connections glowing magenta and green. A powerful form of microscopy maps connections between neurons and could help researchers better understand communication between the cells. Each neuron connects to hundreds or even thousands of others through tiny junctions called synapses. Under a light microscope, synapses may blur together. Electron microscopy can show synapses at higher resolution, but this technique requires preparing samples in ways that can damage synaptic proteins. In the new study, published 8 October in Cell, researchers used a form of high-resolution light microscopy called stochastic optical reconstruction microscopy (STORM) to look at neurons and their connections in the mouse retina — light-sensitive tissue at the back of the eye1. Ordinary light microscopy cannot resolve fluorescently labeled structures that are close together. STORM, introduced in 2006, involves taking pictures of separate groups of widely spaced labels and combining them into a highly detailed image. STORM can distinguish between features that are 20 nanometers apart — about the distance across a synapse. To get good depth resolution while looking through the tissue, the researchers sliced sections just 70 nanometers thick and then digitally combined the images of each slice. Using fluorescent markers that bind to synaptic proteins, the scientists highlighted the synapses and the proteins on either side. They also engineered the mouse neurons to express fluorescent proteins, revealing the shapes of whole neurons. The researchers created an automated program to identify the location and type of each synapse based on the distribution of specific proteins at each one. The program can distinguish between synapses that enhance signals versus those that dampen them, revealing their arrangement within the retina. The new imaging platform could reveal how autism-linked mutations in genes that encode synaptic proteins might alter brain circuits.